The Matthews Quik Corners Frame with Ears is an innovative approach to the design, manufacture, and assembly of overhead and butterfly frames. Fast and easy to set-up, this 8 x 8' (2.4 x 2.4 m) Quik Corners Frame features a positive-locking corner system and sliding pin with T-handles. After being firmly secured to the stand the quick, positive locking/unlocking mechanism captures and securely retains the frame's integrity even when the sliding pin has been placed in an off-center position. This frame includes two mounting ears. A sliding 5/8" pin is available separately. 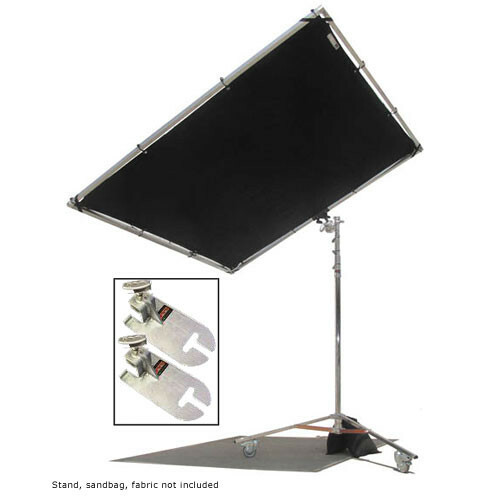 The components nest together into a 2" square package with no protruding corners angles, handles or rings to hang-up on when loading or removing from your grip truck. Frames are manufactured from the highest grade (0.120 wall thickness) aircraft quality aluminum alloy with a 50% greater wall thickness than standard frames. Box Dimensions (LxWxH) 96.0 x 10.0 x 6.0"
Is it really solid when it is hold by only one stand? If you're using it outdoors, use two stands. It's the responsible thing to do, even if there's no wind when you assemble the rig. How small does this pack down to? Does it come with a bag? The frame is 2 x 2 x 8' and the ears are about 4 wide by 2 thick x10 long and no bag.